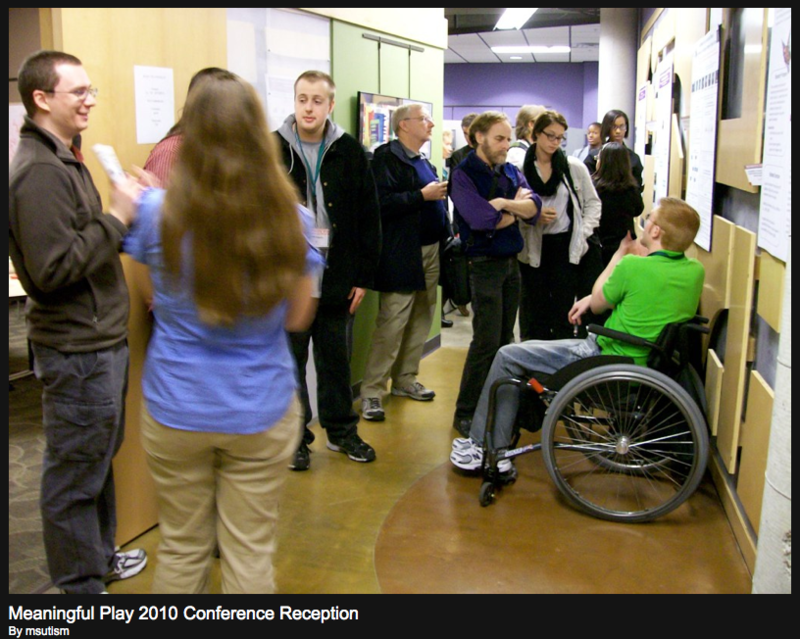 Meaningful Play 2010 | Lit 2 Quit! This past October Dr Kinzer and I (Jess Mezei) attended the biennial conference Meaningful Play (MP) at Michigan State University on behalf of the Lit2Quit team. I presented the first physiological and emotional data results of our alpha phase of research for the Rush mode of our game. You can flip through the presentation below and get in touch if you have any questions/comments. The presentation was apart of the Assessing Games for Health track and also featured Rob Goldman’s presentation about At-Risk a suicide prevention training simulation and Laurie Hartjes’ work about a malaria reduction game. 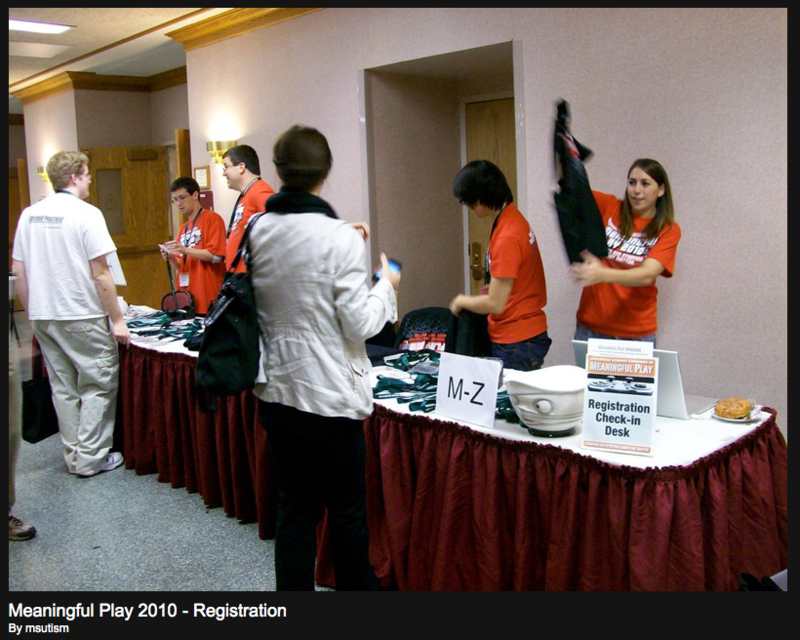 We were also caught on camera by the event crew at registration and wondering during the game expo and poster session. François Boucher-Genesse’s poster and game called Mechanika. Which is a physics game that feels like a mashup of Lemmings and World of Goo. The goal of Mecanika is to collect stars with little rocks by creating a path of impulsions, accelerations and rotations. It will be a freely available as a flash game that you can play on the Games for Science.ca website . Dan White and the team from Filament Games and their work on learning games. I was particularly interested in their science games and found out they have been collaborating with the JASON project. Some of their science games such as Ecodefenders, Transform it! and Energy city are live and free to play on JASON site. The crew from gambit (MIT’s gamelab) also didn’t disappoint with presenting incredibly thoughtful and esthetically beautiful games. I was able to see the game Yet One Word in action at the game expo night. It’s a game that is apart of their Sophocles project aimed to invoke personal reflection. It prompts the player to come up with words that reflect their lives, actions, and relationships in order to progress while maneuvering a faceless horned character through a world of perilous platforms. They also presented a game called Elude that deals with the oscillating experience of depression. By the end of the conference, both games were recognized as award winners, which was well deserved! Additionally, there were some great key note speakers featured at the event. James Gee, Contance Steinkuehler, Ben Sawyer, Robin Hunicke, Katherine Isbister and Helle Winding made the lineup. Lucky for us, the film crew at the event captured each of the keynote addresses and you can view them from the MP website. enjoy!